Learn about the temperament and personality of the German Pinscher. Discover what he's like to live with, his traits and characteristics and how he generally behaves. And look at lots of German Pinscher photos. The German Pinscher is both companion and guardian, small enough to curl up in your lap, and big enough to protect you. He is a confident, intelligent, independent, and assertive dog, and needs an owner with more leadership than he has, or he will run the house. 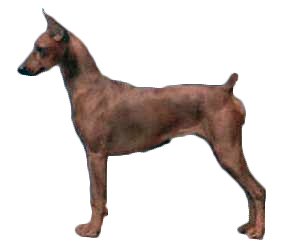 The German Pinscher needs fair and consistent discipline. A commitment to obedience training is a must with this breed. He has a high aptitude for training but is slow to learn. (But he's quick to housetrain.) He is a problem solver with a strong will -- so you want him on your side. This spirited dog can be a bit manipulative. He loves to have a job to do and makes a great working dog. He also excels at obedience, tracking, and agility competition. He is truly a multipurpose companion. Though they are rarely problem barkers, they make very good watchdogs. They are alert, vigilant, watchful of strangers, and will not back down from a fight. They are fearless. These are high-energy dogs who require daily exercise. If they get bored, they will chew, dig, and destroy. They are rarely seen walking. They are usually either at a trot or a dead run. And they have incredible stamina. They have a strong prey drive and will chase things, so they are safest on lead or in a fenced in-yard. They keep their playfulness well into adulthood and are good with respectful children, though they do have long memories and a German Pinscher might hold a grudge if a child mistreats him. German Pinschers also tend to want to greet their loved ones by jumping on them, which could flatten a young child. The German Pinscher is certainly loyal and devoted to the ones he loves. He is affectionate and will want to sleep under the covers with you. He will insist on being part of all the family activities. The German Pinscher is harder to train than most other dog breeds. He learns new commands more slowly than the majority of other breeds. You will need to be extra patient when Training him. The German Pinscher sheds a fair amount of hair. You'll find hair stuck to your couch, carpets, clothes and everything else in your home.